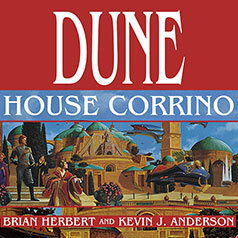 In Dune: House Corrino, Brian Herbert and Kevin J. Anderson bring us the magnificent final chapter in the unforgettable saga begun in Dune: House Atreides and continued in Dune: House Harkonnen. Here nobles and commoners, soldiers and slaves, wives and courtesans shape the amazing destiny of a tumultuous universe. An epic saga of love and war, crime and politics, religion and revolution, this magnificent novel is a fitting conclusion to a great science fiction trilogy...and an invaluable addition to the thrilling world of Frank Herbert's immortal Dune. Fearful of losing his precarious hold on the Golden Lion Throne, Shaddam IV, Emperor of a Million Worlds, has devised a radical scheme to develop an alternative to melange, the addictive spice that binds the Imperium together and that can be found only on the desert world of Dune. In subterranean labs on the machine planet Ix, cruel Tleilaxu overlords use slaves and prisoners as part of a horrific plan to manufacture a synthetic form of melange known as amal. If amal can supplant the spice from Dune, it will give Shaddam what he seeks: absolute power. But Duke Leto Atreides, grief-stricken yet unbowed by the tragic death of his son Victor and determined to restore the honor and prestige of his House, has his own plans for Ix. He will free the Ixians from their oppressive conquerors and restore his friend Prince Rhombur, injured scion of the disgraced House Vernius, to his rightful place as Ixian ruler. It is a bold and risky venture, for House Atreides has limited military resources and many ruthless enemies, including the sadistic Baron Harkonnen, despotic master of Dune. Meanwhile, Duke Leto's consort, the beautiful Lady Jessica, obeying the orders of her superiors in the Bene Gesserit Sisterhood, has conceived a child that the Sisterhood intends to be the penultimate step in the creation of an all-powerful being. Yet what the Sisterhood doesn't know is that the child Jessica is carrying is not the girl they are expecting, but a boy. Jessica's act of disobedience is an act of love—her attempt to provide her Duke with a male heir to House Atreides—but an act that, when discovered, could kill both mother and baby. Like the Bene Gesserit, Shaddam Corrino is also concerned with making a plan for the future—securing his legacy. Blinded by his need for power, the Emperor will launch a plot against Dune, the only natural source of true spice. If he succeeds, his madness will result in a cataclysmic tragedy not even he foresees: the end of space travel, the Imperium, and civilization itself.